The UPS Store offers products & services designed to help small business owners run with the efficiencies big business enjoys, but without the big business investment. Digital printing, print finishing services, shipping & packaging services, mailbox rentals are some of the services small businesses will find at any one of our over 360 neighbourhood locations. The UPS Store opportunity offers our franchisee network rewarding potential, built on our strength, security & experience. The UPS Store® interior is designed to promote a comfortable, yet professional business environment, with a contemporary appearance focused on products and services small businesses need every day. Typically located in shopping centres and commercial complexes, The UPS Store locations are also found in venues like airports, convention centres & hotels. Location sizes range from 800-1200 sq. ft. Stores generally employ full-time staff of two or more employees, including the owner/operator. Hours of operation vary, but locations are typically open Mon-Fri from 8 am to 7 pm & Sat 9 am-5 pm. When you are awarded The UPS Store franchise, you join a pioneering network that has led the industry for over 30 years. From the moment you open your doors as The UPS Store, you become an integral part of a globally respected brand. A combination of national advertising campaigns is implemented to reinforce brand awareness, along with regional and local marketing initiatives to help drive business to your store. The UPS Store franchise network supports your efforts through our Area Franchisees & Managers throughout Canada. Our Area Teams are experienced retail operators and are available to assist and guide you as you open and build your franchise business. The UPS Store is experienced with lending practices and the process of working with leading financial institutions to raise required capital to develop your franchise. The UPS Store is a respected retail franchise operation, highly sought after by major landlords across Canada. This allows us to secure quality retail locations at fair market value. By combining market research, field experience and local knowledge, we establish the optimum retail leasing opportunities available to you, and take you through the process of securing your franchise location. Standardized designs offer a consistent store image & consistent customer experience across our network. 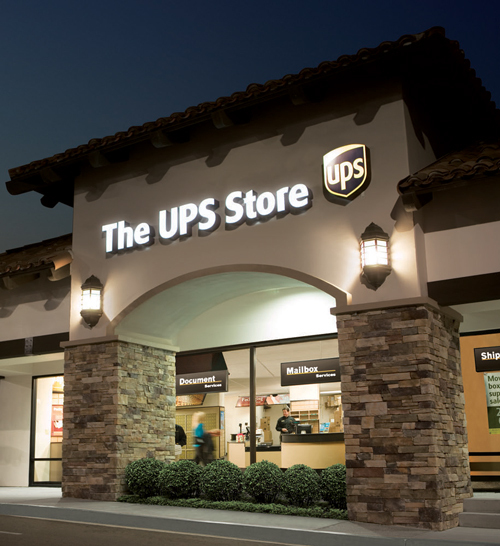 The UPS Store franchise network will provide you with proven floor plans and store fixtures adaptable to almost any site. A fully comprehensive training program is provided to you as a The UPS Store franchisee, broken into four phases including 11 days of classroom training at the corporate head office in Oakville, Ontario. For more than 30 years, entrepreneurs have been benefiting from franchise ownership with The UPS Store. Now it’s your turn. Family friendly hours of operations. Small retail footprint lowers occupancy costs. Consider the benefits of working within a structured yet innovative professional network, with more than 30 years of retail and franchising experience and expertise. The skill sets that you have acquired in the Canadian Forces will serve you well when being successfully applied to building your own small business as a franchisee of The UPS Store Canada. Canadian Veterans Save $10,000 in Franchise Fees. As our way of saying thank you for your military service, and to assist you in successfully transitioning into civilian life, qualifying veterans enjoy $10,000 off the franchise fee of a new The UPS Store location in Canada, and 50% off the initial application fee. Your military service helps keep the Canadian dream alive. Now it’s the time to start living your dream with The UPS Store network in Canada.